Epothilone D (Epo-D) is a paclitaxel-like microtubule-stabilizing agent that was isolated from the myxobacterium Sorangium cellulosum. Although epothilone D can inhibit proliferation in multiple tumor cell lines, the effect of epothilone D on neointimal hyperplasia after angioplasty has not been reported. Some experiment result that epothilone D may regulate the cell cycle G1-checkpoint proteins as its major molecular mechanism for inhibiting neointimal hyperplasia after in vivo rat carotid artery injury. The 9-(S)-Epo D and 9-(R)-Epo D demonstrated significant difference in inhibition activities against cancer cell lines and in conformational analysis. The ring-opening or ring fragmentation reactions of cyclopropanol intermediates are used in the total synthesis of epothilone D for the creation of trisubstituted double bonds, an ethyl ketone functionality, as well as for the protection of carboxylic and ester groups. Epothilone D is obtained in 1.6% overall yield (24 steps in the longest linear sequence) starting from (R)-methyl 2,3-O-isopropylideneglycerate. The key cyclopropanol intermediates are efficiently obtained by titanium(IV)-catalyzed reactions of readily available esters with Grignard reagents. 1. Tack-Joong Kim et al: Vascular Pharmacology, 47(4) 2007, 229-237 "Epothilone D, a microtubule-stabilizing compound, inhibits neointimal hyperplasia after rat carotid artery injury by cell cycle arrest via regulation of G1-checkpoint proteins"
2. Feng Sang et al: European Journal of Medicinal Chemistry, 68 (2013) 321-332 "Epothilone D and its 9-Methyl analogues: Combinatorial syntheses, conformation, and biological activities"
3 Robert L. Broadrup et al: Bioorganic Chemistry, 33(2) 2005 116–133. "Total synthesis of 12,13-desoxyepothilone B (Epothilone D)"
4. 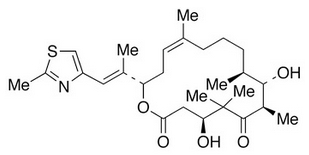 Alaksiej L.Hurski et al: Tetrahedron Letters 51(27) 2010,3497–3500 "Total synthesis of epothilone D by sixfold ring cleavage of cyclopropanol intermediates."